The Moto E5 Plus is designed with a reflective wave pattern and an arched back for a look as great as it feels. The rounded corner front glass panel provides smooth edges, and in the back, the aerial is hidden away. Discreetly located within the phone’s logo, simply touch the fingerprint reader to wake up and unlock your phone instantly, and lock it again when you're done. The sleek 6" Max Vision display on the E5 Plus offers a comfortable one hand experience. Multitask effortlessly on a split screen and Customise which Moto experiences you’d like to take advantage of by simply visiting the Moto app on your new phone.. With the front-ported speaker, hear conference calls and your favourite music and movies perfectly, even when the phone’s lying on its back. A 3.5 mm headphone jack allows you to enjoy your music on the go. 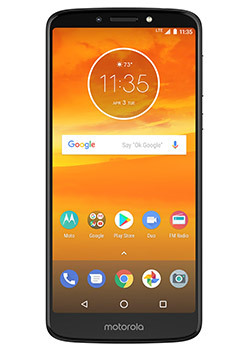 Motorola’s Moto E5 Plus offers a 12 megapixel rear camera that focuses in an instant with laser autofocus technology and lets in more light with large, 1.25 μm pixels. Flip the device around and capture the perfect selfie on the 5 megapixel selfie camera, that uses the dedicated front flash to snaps you and your friends in superb lighting, day or night. Be efficient thanks to the Qualcomm® Snapdragon™ 425 processor with 1.4GHz Quad-core CPU and Adreno 308 GPU, 2GB RAM and 16GB of internal memory. Add up to 128 GB more photos, songs, and movies thanks to a dedicated microSD card slot. Don’t forget to enjoy all that Android Oreo has to offer on the go for longer, thanks to a huge 5000 mAh battery providing up to 1.5 days of battery life.